Below is Chris Groves' write up of the Animate Earth event run by the Cardiff Philosophy Cafe in conjunction with Cardiff sciSCREEN. How do people in industrialised, technological societies relate to nature? Do we recognise ourselves as part of nature, our societies embedded within living systems that surround and sustain us, or do we view ourselves as separated from a natural world that is nothing but malleable matter to be put to whatever use we wish? Do we feel ourselves to be closely and vitally linked to the places we inhabit, or do we increasingly find ourselves ‘in transit’ between home, work and leisure, between locations defined solely by their function rather than finding our homes in places defined by their emotional significance and cultural meaning, and in which we have our ‘roots’. The meaning of nature and of place in our lives was the subject of the first of two Cardiff Philosophy Cafe events in March 2013, a special film night held at the Gate with the assistance of Cardiff sciSCREEN and with sponsorship from the Sustainable Places Institute at Cardiff University. The evening included a showing of the film ‘Animate Earth’, written by Schumacher Institute ecologist Dr Stephan Harding and based on his book of the same name, followed by a panel discussion sparked by the responses of human geographer Jon Anderson, artists Stefhan Caddick and Glenn Davidson, and bio-archaeologist Jacqui Mulville to the film. In the film, Harding describes how, as a scientist, he came to see how science was practised as symbolic of how we, as humans, relate to nature. In the history of science he finds plentiful evidence of a movement away from antiquity, with its notions of the belonging-together of intuitive knowledge and reason, and towards a new model of knowledge in which mathematics and quantification represented the highest form of human knowledge. At the same time, the new science brought with a new world, one in which the inherent tendency of human beings to feel apart from the world around them was exacerbated by technological attitudes that saw nature as raw material, dead matter for manipulation. Harding speaks of how two scientific figures, the poet and naturalist Johann van Goethe and then James Lovelock, came to represent for him the principles of a new science in which the ancient Greek harmony of intuition and reason could be resurrected. A science for the 21st century would require, according to Harding, a return to forms of intuition both in order to reconnect us to the natural beauty to be found in the places we inhabit, but also to grasp the ways in which the natural world is a system of interconnections. At the first level, reason cannot deliver us the individuality and uniqueness of a natural form – only attention and imagination, which lie at the centre of Goethe’s conception of the scientific method, can do that. At the second, reason cannot grasp the complexity of the world system – only imagination can seize, in a moment of insight, what reason cannot see, thus guiding reason in its detailed examination of the parts of this whole. Science – and indeed our wider relationship with nature – requires that we participate in this dialectical movement that shifts from our place in the world to the whole planet and back, from an enlivened connection to the local to an enriched holistic grasp of the global. Harding presents Lovelock’s Gaia hypothesis as an example of intuition-guided science at work, in which the Earth as a whole is imagined as a self-organising system. This intuition, which occurred to Lovelock in the 1960s, subsequently led him to investigate the relationships which exist, across geological time, between chemical, hydrological and climatic processes, and to produce more specific hypotheses about how these relationships work. Deploying an impressive array of interviewees, from systems theorist Frijthof Capra to physicist and environmental justice campaigner Vandana Shiva, Harding argues that only an appreciation of the material world as animated with its own vitality can effectively supplant the mechanistic view of nature as dead matter and provide us with the basis for a new relationship with nature. New forms of scientific knowledge, for Harding, are the only way to guide us into a new ethical relationship with the Earth, in which natural entities are valued for their own sake. Following the screening, the panel offered four distinctive and diverse responses. Jon Anderson asked whether the ‘we’ implied in Harding’s film can really stand for ‘us’, or whether it represents a particular style of human experience of the world, which Jon suggested may be uniquely characteristic of the ‘tribe’ of scientists. Human geography, he pointed out, shows us that the connection with place and nature Harding sees as the end point of a journey back from the mathematical to the intuitive mind is actually always and already part of our everyday lives. It is where we start from rather than where we need to get back to , and human geography shows how humans as emotional, spatial creatures (as well as cultural ones) build meaning into their lives through attachment to place. Perhaps we need to remember this better, but the picture of estrangement Harding paints is not universal by any means. Stefhan Caddick showed examples of his work which relate intensely to the social character of places, amplifying Jon’s point by showing how people demonstrate their attachment t0 – and often troubled, conflictual relationships with – places through collective action that itself grows out of collective history. Rather than as individuals contemplating nature, people participating in his artworks reveal themselves to be groups animated by a sense of place and acting through it. Glenn Davidson showed examples of his work which examine the relationship between abstract data and the reality of place, and also look at the uses of data and the way it can support particular kinds of human relationship at the expense of others (government vs democracy). He asked whether Harding means something else than just ‘connection’ by the concept of intuition, and explored how the development of disciplined intuition can give us new knowledge in particular circumstances and as a component of specific practices. In particular, he pointed to how the training of artists in art colleges rests on the development of a kind of intuition, rooted in attention. Jacqui Mulville asked to what extent the characterisation of the scientific method given by Harding was true of science generally beyond very specific examples. In her field, archaeology, she noted that intuitive methods were very important. If intuition does produce additional knowledge through the disciplining of attention and imagination, then maybe it is something that scientists make use of in their daily work anyway, although with differing levels of awareness. 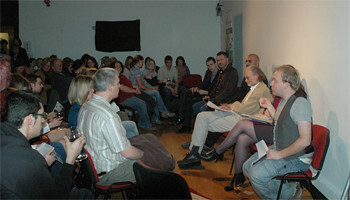 After throwing open the discussion to the audience, a significant degree of scepticism was evident about the use by Harding of the idea of intuition. What, in reality, does this term mean? The value of intuition, it was suggested, seemed to be rather like the value of ‘interconnectedness’ or ‘holism’ – it seemed almost, one audience member suggested, like a ‘magic word’ which everyone could experience positive if vague feelings toward (like ‘holism’). But as to its specific meaning and how it could be actually used by others to change the way in which they experienced nature, the film had little to say and perhaps little indeed could be said. Perhaps intuition was more like an esoteric teaching, something which had to be experienced as part of a kind of apprenticeship rather than a ‘recipe’ to be simply passed on and followed. Intuition, another audience member suggested, might be best thought of as a kind of ‘speeded up’, habituated subconscious thought that goes on in the background and enables us to make judgements without going through a series of steps. But, it was asked, weren’t Jacqui and Glenn right to suggest that intuition gives us additional knowledge that we couldn’t get from step-by-step reasoning? Doesn’t Harding’s examples of intuitive grasping of processes and relationships suggest that a kind of imaginative effort is going on in which a whole is somehow made present to us in ways that reason, with its analytical focus, cannot manage? Finally, one audience member saw the film as a kind of ‘confession’ (in the style of St Augustine), a journey undertaken in a kind of spirit of repentance. But if this is so, then how universal can this journey be? As Jon Anderson suggested, might we need to look elsewhere for ways of connecting to nature that derive from the kinds of things we ourselves do in our daily lives, in the particular communities we inhabit? Is the journey of a repentant scientist as exemplary as the film portrays it, or is the story told by the film just another way of maintaining the privileges accorded to scientific knowledge within our society?